Cline Rents offers a number of excavators with different buckets and attachments to meet your needs for excavating in Woodinville. We try to stock the most useful mix for a variety of jobs needed by people wanting to do an Woodinville excavator rental. Woodinville commercial operations and individuals alike will find we can often meet their needs. Never permit riders in the bucket, cab, or anywhere else on the machine. Excavators only have one seat, which is meant for the operator. Never attempt to operate the excavator unless you are sitting in the seat and in full control. Reduce the excavator’s speed when working on rough terrain or within congested areas. Carry the bucket low to the ground during transport. This will increase visibility and machine stability. When moving the excavator around the job site, select a route that is as flat as possible. Steer the machine as straight as possible and only make small gradual changes in direction when turning is needed. Travel directly up slopes vertically instead of diagonally. When propelling up slopes, the boom and the arm should be extended with the bucket carried low and rolled out. This will allow you to drop the bucket and prevent the equipment from sliding if necessary. When propelling down a slope, the bucket bottom should be low and parallel to the ground. For better stability, work with the propel motors to the rear of the machine. Dump spoil piles as far away from the excavation as possible to avoid cave-ins. When doing excavation jobs on slopes, level the machine by digging a shelf (or bench cut). Material removed from the upper slope can be used to build up the lower slope and create a level surface. On steep bench cuts, cut enough away from the upper bank to allow for adequate swing clearance when casting downslope. Never dig underneath the excavator. When backfilling a cave-in, the excavator’s tracks should be at a 90-degree angle to the excavation with the propel motors to the rear of the machine. When loading trucks, never swing the excavator bucket or the truck cab. By swinging over the rear of the truck, any loose materials will fall on the ground or in the bed, rather than on the cab. Never attempt the clean the excavator’s bucket by striking it on the ground or against another object. Make sure that all the mirrors are clean and properly adjusted. Make sure the propulsion system and controls are working correctly. Call your local utility company to have the job site marked for underground lines or structures. Only make small, gradual turns. Don’t try to carry loads that exceed an excavator’s operating weight capacity. Park on a level surface with the bucket lowered. Don’t dig underneath sidewalks or other structures without a support system to prevent a dangerous collapse. 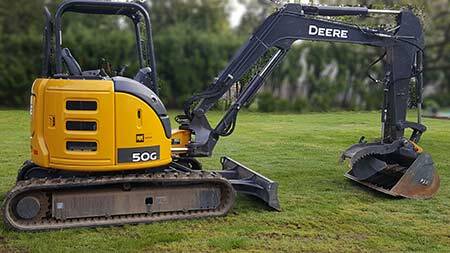 If you are using your Woodinville excavator rental in a trench digging operation make sure you also consider these additional factors provided by the University of Iowa Environmental Health and Safety. Many times in combination with excavation equipment we see people with the need for a dump trailer. It is great for loading and hauling debris and vegetation for smaller jobs. We do a good amount of dump trailer rentals in Woodinville, as you might expect. Check them out here.